I'm trying to catch up these posts, so here is my layout for last week's 52 Inspirations. I love this picture of Kiki's Hand. She found this shell while we were walking along the shore of the river which runs along War Eagle Mill in Arkansas. 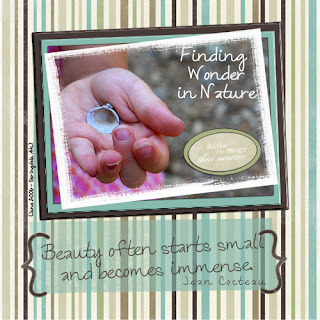 I only thought the shore had rocks, but once she found the shell, I began to see lots and lots of the shells. Sometimes you just need to hang out with a child to find things in the world. Kit: OScraps.Com 52 Inspirations, OScraps.com.